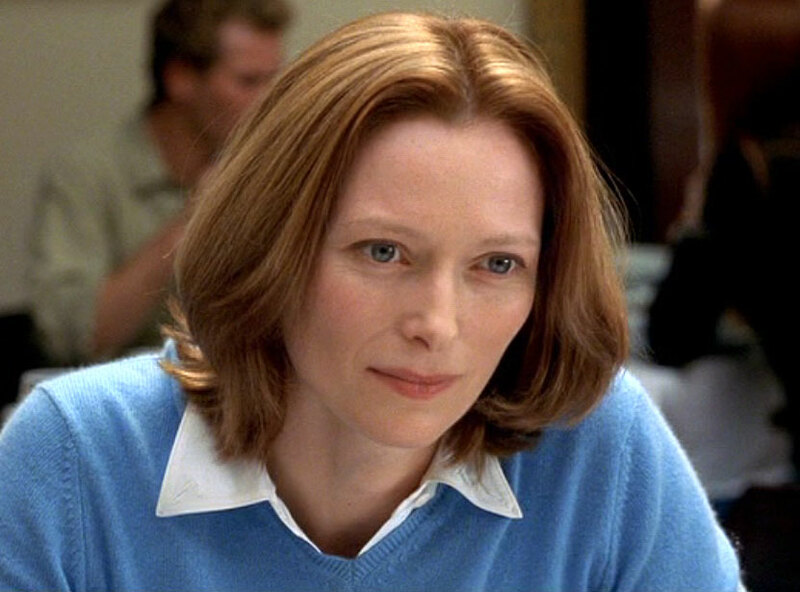 While cheerfully copy-and-pasting Tilda Swinton titles into my “wish list”, I neglected to check how large her role actually was in each of the films I was listing… thankfully, while she may only score a few minutes of screentime in Adaptation (2002), she makes the most of them, milking her character’s polite, enthusiastic confusion for all its worth. For those who don’t know, this semi-autobiographical, meta-textual mindf*ck stars Nicolas Cage as an avatar of the self-deprecating screenwriter ‘Charlie Kaufman’, who is hired by “a lovely, statuesque film executive” (Swinton) to adapt The Orchid Thief, a non-fiction book by American journalist Susan Orlean, based on her investigation into the 1994 arrest of John Laroche for poaching rare orchids. While Charlie struggles with writer’s block and social anxiety, his more extroverted identical twin ‘Donald’ (also Cage) is brimming over with ideas for his own screenplay, a by-the-numbers thriller about a serial killer, hostage and police detective who are actually “multiple personalities” of the same person! The two brothers’ progress (or lack thereof) is intercut with faithful and heartfelt interpretations of scenes from the book itself, featuring Meryl Streep as Orlean and Chris Cooper as Laroche. But when Charlie learns that Donald has sold his formulaic pot-boiler for a six-figure sum, he finally cracks and asks his sibling for some writing tips… at which point the film slowly morphs into an absurd crime thriller, with Orlean and Laroche recast as the drug-snortin’, car chasin’, gun totin’ bad guys, and the Kaufman Boys recast as the hapless amateur sleuths who “see too much”. I’d only seen Adaptation once before, several years ago, and had somehow forgotten how funny it is. I can imagine that many viewers would be put-off by the smart-arsy, self-reflexive humour and deliberate genre-bending, but as an aspiring screenwriter myself, I found a lot here to laugh about…. and a lot to think about too. 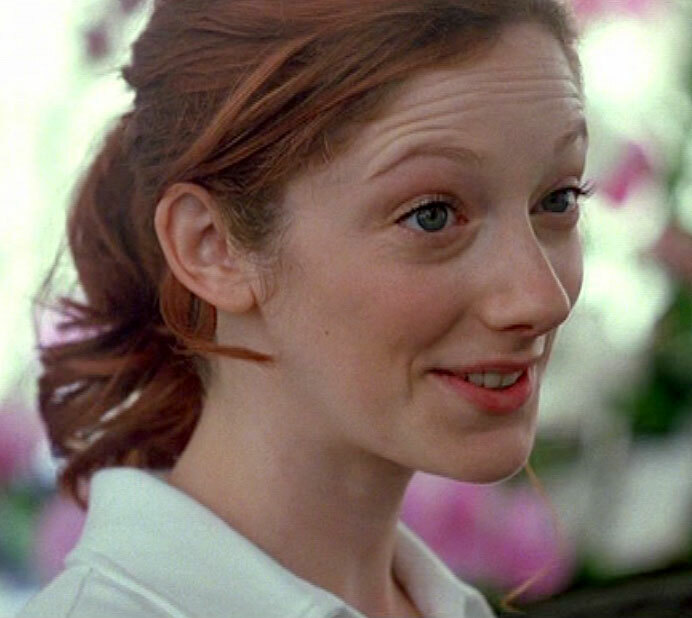 Meanwhile, there are also some fun cameos to enjoy: Catherine Keener as herself… Maggie Gyllenhaal as ‘Caroline’, a sweet make-up artist who falls for Donald… and Judy Greer as ‘Alice’, a diner waitress Charlie awkwardly tries to flirt with (her look of outraged disgust is absolutely hilarious). Fun fact: Orlean also wrote an article about a group of young surfer girls in Maui, that inspired the film Blue Crush! She seems to be a remarkably good sport considering how her fictional incarnation behaves on-screen, and even accepted a (sadly deleted) cameo in the film as a woman who laughs near/at Charlie in a supermarket. This entry was posted in Rants about Films and tagged Adaptation, Catherine Keener, Judy Greer, Maggie Gyllenhaal, Meryl Streep, Susan Orlean, Tilda Swinton. Bookmark the permalink.